Cambodinucks - Scott and Sonia Fraser pack up for a two year stint volunteering in Battambang Cambodia. 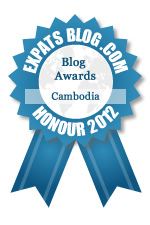 ExpatsBlog.com Expat Blog Awards 2012: Cambodia Honourable Mention Award! This blog won the Honourable Mention Award for best expat blog in Cambodia!